He was wounded by a sniper. Ukrainian serviceman Ruslan Bahlyk, 20, died in the Mechnykov hospital in Dnipro, an adviser to the regional administration head, Tetyana Huba, has said on Facebook. "Ruslan Yevhenovych Bahlyk, 20 years old, a resident of the town of Trostyanets, Sumy Region, died in a hospital… Ruslan passed awat without regaining consciousness, with his father at his bedside. Doctors had been fighting for his life until the last moment," she said. The serviceman was heavily wounded by a sniper on 19 June. 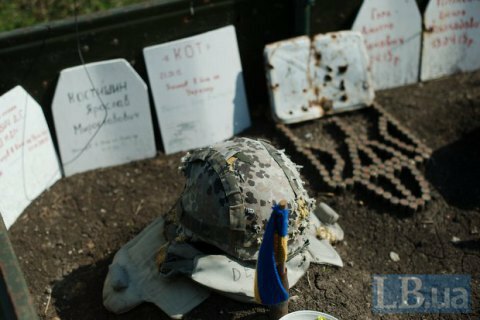 Overall, one Ukrainian serviceman was wounded amid 24 attacks by pro-Russian militants in Donbas, according to the Joint Forces Operation HQ. On four occasions, the enemy used weapons banned by the Minsk agreements. In the Luhansk sector, Krymske was a hotspot with militants using 120-mm mortars, grenade launchers and small arms. In the Donetsk sector, Avdiyivka and Kruta Balka came under fire from 82-mm mortars, grenade launchers and small arms. Positions in Maryinka, Kamyanka and Verkhnyotoretske came under targeted fire. The enemy used grenade launchers, heavy machine guns and small arms on the front line near Mariupol.